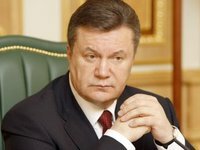 President of Ukraine Viktor Yanukovych has asked Prosecutor General Viktor Pshonka to immediately release all people detained at rallies in Kyiv whose degree of guilt is not serious. A number of people who were savagely beaten by Berkut riot police at a peaceful anti-government rally in Kyiv on November 30 have been put on trial in recent days. "I once again talked with the prosecutor general yesterday. I asked him to find a way to free some people who did not commit major violations. I think this issue will be resolved today. It's difficult for me to say how many people will be released, but people who have young children, young families, they will be released… Everything will be taken into account," he said during the meeting with the ex-presidents of Ukraine on Tuesday. "Frankly speaking, I want to turn over this unfortunate page and never allow this again…Surely, it's unacceptable to block roads, administrative buildings… The life of the country continues," he said.